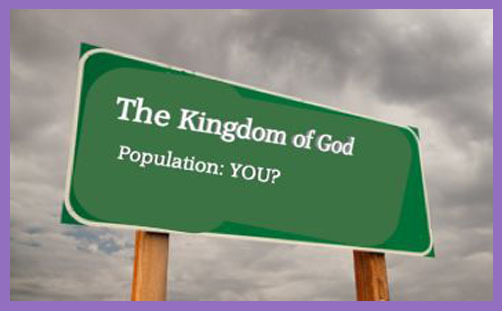 Where is the Kingdom of God? Does it matter? How can it be both within you and yet still to come? Or has it already come? And if it hasn’t, when will it come? And how will we know it has come? Or has it come and we missed it? Does anybody care? The whole thrust of Jesus’ preaching on the Kingdom of God would have created an eschatological crisis for his audience – a bit like the apocalypse of Brexit. You know, floods, earthquakes, plagues of terrorists, and the coming of Boris the Messiah. But Jesus gave the distinct impression that ‘the end’ was imminent (Lk 9:27). He preached both that the Kingdom was near (8:1) and that it had come (11:20). He was fulfilment of Isaiah 61 (Lk 4:18f), and the disciples were urged to be ready at all times (12:40). The Kingdom of God (or the reign[ing] of God or the realm of God or the Kingdom of Heaven) was an apocalyptic image central to Jesus’ world. ‘Kingdom’ statements are found more than a 100 times in the gospels, as are mentions of ‘salvation’: the two are fused in Jesus’ essential mission. Luke 17:21 – ‘..the kingdom of God is within you‘ – has traditionally been used to suggest an internal dimension of the kingdom which is both personal and individual. While an exclusive emphasis on this dimension would largely ignore wider society, there is no doubt that transformation begins with individual repentance and salvation (Mk 1:14f, 16-21; Mt 4:17, 18-22), and then works itself out to wider society (Mk 3:14; Mt 10:1-8). This perspective is rooted in the observation that Jesus never addressed the macro-socio-political issues of his day, but focused his mission on the well-being of individuals, restoring them to relationship with God. This salvation is a substitutionary atonement (Mk 14:24); a personal response to Christ’s work on the cross, usually called conversion, and the mission is proclamation of the gospel to an unsaved world. It is, however, unlikely that any first-century individual would have perceived himself or herself to have been autonomous from a social network. Individualism is a relatively recent philosophy, emanating principally from the age of Romanticism which brought to the masses a new individual liberty to decide their own fate and destiny. The concern for individual self-realisation and self-development is a distinctive attribute of the post-industrial society. The Western notion of the person as a bounded, unique, more-or-less integrated motivational and cognitive universe; a dynamic centre of awareness, emotion, judgment and action organised into a distinctive whole and set contrastively both against other such wholes and against its social and natural background, is, however incorrigible it may seem to us, a rather peculiar idea within the context of the world’s cultures. It is important therefore to view Jesus’ audience of ‘individuals’ as being situated within and inseparable from their families, communities, and larger socio-political structures. When the gospel is limited to personal salvation, the wider social issues are estranged. While the notion of the Kingdom being ‘within’ undoubtedly has the longest pedigree in biblical translation, there are scholars who prefer it to be rendered ‘among’. This would be more consistent with an inaugurated view of eschatology, and it diminishes the emphasis on saving individual souls for eternal life without any regard for the rest of their earthly lives. Jesus is not concerned to impart apocalyptic secrets to the disciples, but to prepare them spiritually for what lies ahead. In this regard, while he is concerned to stress the certainty of ‘the end’, the thrust of his teaching was that the time of the Kingdom had been inaugurated, and that judgment was soon to fall. This was (and is) to spur believers into making good use of their time before it is too late. This is the essence of eschatology – it keeps alive the sense of imminence in a period of grace, and induces disciples to holiness. Christians are to remain vigilant, living holy lives, in the constant tensions of the ‘soon’ and the ‘not yet’. While the timing of the Kingdom cannot be calculated, it is an assured future event, heralded by the coming of the Son of Man. Scripture talks in terms of a harvest (eg Joel 3:13; Lk 3:17; Gal 6:7; Rev 14:15) which symbolises the parousia. Jesus’ return (Lk 17:20-37) is followed by a heavenly banquet (14:15-24), and he gave every indication that it was an imminent consummation. His constant theme is ‘see and know’ – the disciples see the leaves sprouting to know that summer is near; when they see the signs, they will know that the Kingdom of God is near, and they must be prepared (cf 17:31-36; 12:35-40). But if the Kingdom is ‘near’, and Jesus taught his disciples to pray ‘thy kingdom come’, the Kingdom was manifestly ‘not yet’. The manner in which the Kingdom comes has profound implications for understanding salvation and the nature of mission. If the Kingdom is future, there is an ultimate judgment and ultimate reconciliation. Once salvation is attained, everything in this life is perceived to be ‘of the world’ and destined for destruction (2Pt 3:10-13). While a positive dimension of this understanding includes a sense of urgency in proclaiming salvation, such an emphasis conveys a solely spiritual kingdom. The motivation for repentance becomes the future promise of ultimate reconciliation, and appeals mainly to those who are dissatisfied with their current situation in a fallen world. Jesus expected an imminent Kingdom of God, and the fact that it didn’t appear compels us either to impose a ‘spiritual’ dimension onto Jesus’ proclamation of the Kingdom, or somehow to explain his ‘error’. Faced with these options, the emphasis has fallen on the soteriological meaning of Jesus’ personal destiny and the obedience he rendered to God. But the presumption of imminence is itself underpinned by the assumption that Jesus was primarily preoccupied with the end of time: the Kingdom of God would soon arrive to bring about the end of the physical world and its linear flow of natural history. On that basis, New Testament scholarship has operated predominantly in the tension between the ‘now’ and the ‘not yet’. But it is unlikely that anyone in first-century Palestine would have defined present reality in such future-oriented categories. In the pre-Einsteinian, pre-Enlightenment and pre-Newtonian peasant societies, time was predominantly present-oriented, functional, and non-directional. Time is rarely, if ever, viewed in traditional cultural settings as an abstract concept removed from the patterns and rituals that relate it to the ordering of social life. In that sense, the past and the future do not exist apart from some direct link to a presently-experienced person, event, or process. The Western post-Enlightenment regulation (obsession?) of life by the calendar and the clock would be distinctively alien to other cultures, past and present, and it is likely that first-century language about ‘the end’ referred neither to linear historical time nor to the demand of bringing people face to face with a promise of heaven. Apocalyptic language was directed to the qualitative dimension of life, and to the resolution of the present historical crisis. It indicated a depth experience rather than an objective future expectation. In that respect, it presented ‘the end’ as the fulfilment of a promise; God’s fidelity in the midst of suffering, frustration, and hopelessness. We are there still.